The Omega boys' integrated study of dinosaurs culminated in this morning's Dinosaur Presentation, one of my favorite Saint David's experiences. 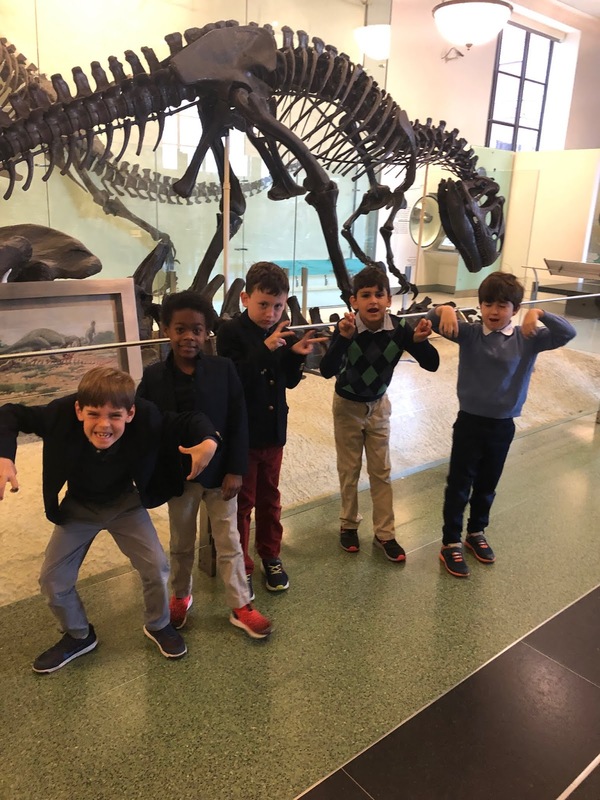 During their spring study, the boys had opportunities to work in groups, use maps, conduct research, and explore the concepts of time periods and archaeology. Their study also included a field trip to the Dinosaur exhibit at the American Museum of Natural History. 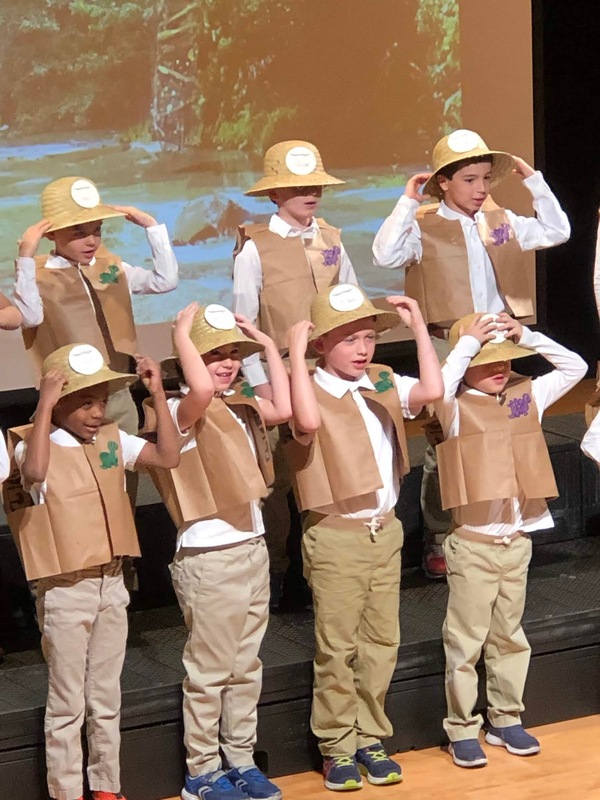 In this morning's show, they presented facts about dinosaurs, recited poems, and sang songs. 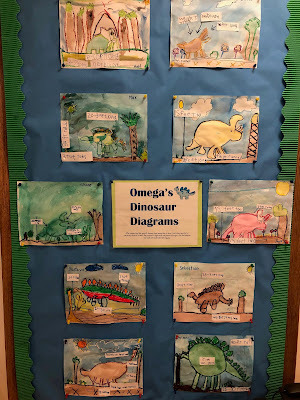 Some featured special verses written by Omega students reflecting their learning about dinosaurs, and others were among their favorites from music class, including one in Spanish. The knowledge, confidence, singing ability, and stage presence of the presenters impressed us all. Well done, boys! The field of paleontology is well served by you! Special thanks to Omega teachers Emily Cawley and Katy Jonas, and to Choral Director Phyllis Clark and Music Chair Jeff Moore for working with the boys on this delightful presentation. Through our school's partnership with the DNA Learning Center of Cold Spring Harbor, our eighth graders are working with Ms. Lee of DNALC and Saint David's science teacher Mr. Bell on a hands-on DNA unit that involves a series of increasingly complex labs conducted over several weeks, and culminates with an original DNA barcoding research project. As the video shows, the boys are following the protocols and using the same tools for DNA extraction, including pipetters (highly precise tools that measure and transfer liquids) and centrifuges, used by DNA researchers in labs around the world. The partnership with DNALC connects our boys in real and meaningful ways to the science of DNA, and, as our eighth grader notes, "It's a lot of fun!" 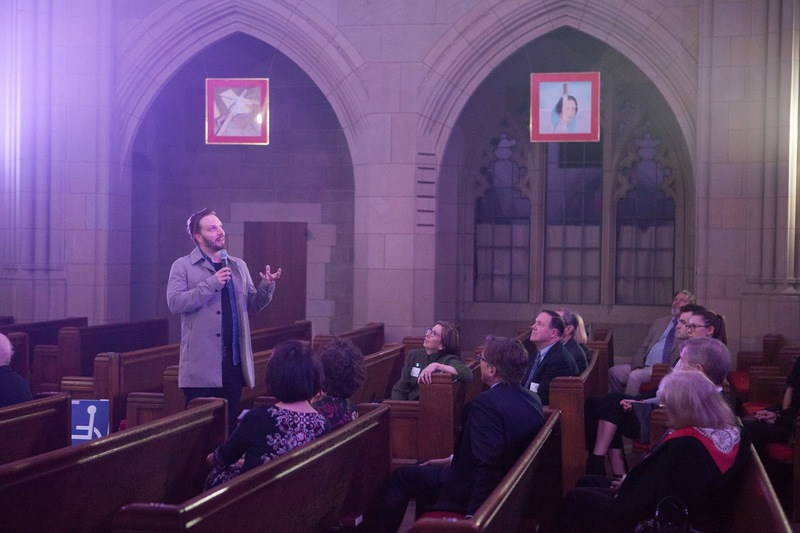 Peace and Release - The Remarkable Experience of "Les Colombes"
Friday evening's Alumni Parents Cultural Event -- a special showing at the opening of Michael Pendry's Les Colombes at the Church of the Heavenly Rest -- was truly a gift to the spirit. 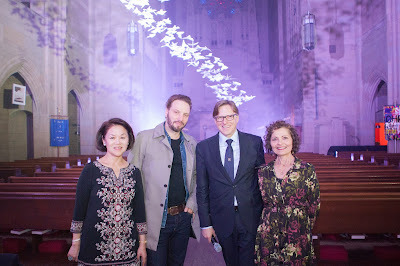 The remarkable evening began with an introduction by the artist himself. Mr. Pendry spoke of how his work, which is part of the Art for Peace project, began in Munich in 2014, where he drew inspiration from the doves in the ceiling of that city's Church of the Holy Spirit. Doves, Christianity's symbol of the Holy Spirit, are also symbols of peace. 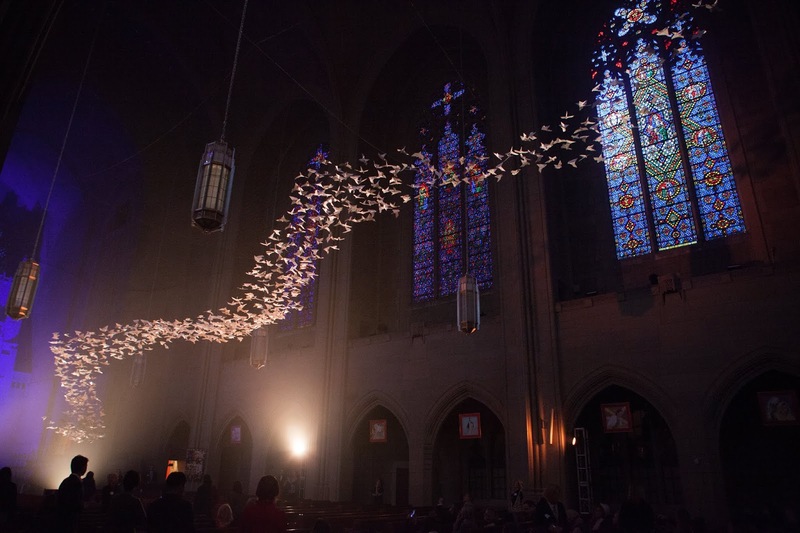 The duality resonated with Mr. Pendry, leading to the creation of a traveling installation that consists of approximately 1,500 weightless doves, suspended from overhead netting in a 45-foot pattern. Traveling the world, Les Colombes has appeared in houses of worship in Munich, Jerusalem, London, and Salisbury. It is currently short listed in the UK for a best contemporary installation award. In each city where Les Colombes is shown, the origami doves, carrying messages of hope and peace, are made and contributed by local children and adults. 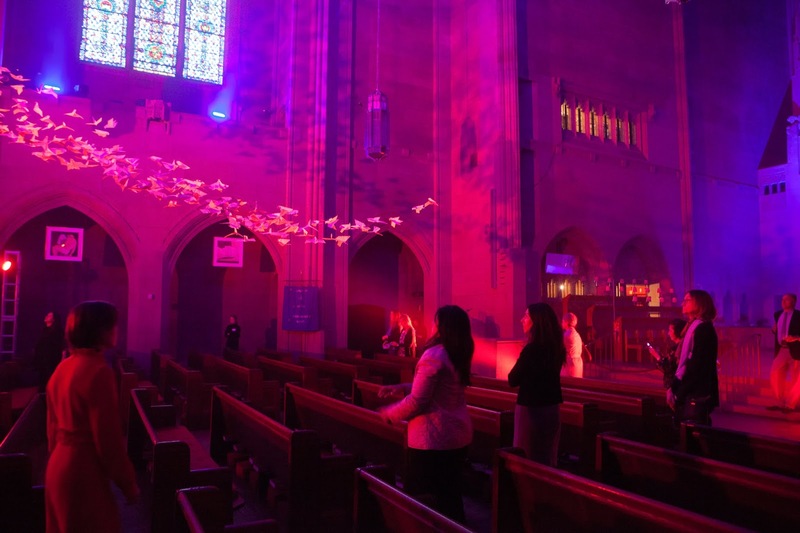 For the New York exhibit, each fourth grader at Saint David's crafted and contributed doves, penning their own thoughts about spiritual release onto their creations. This project connects so meaningfully with the values and mission of our school. 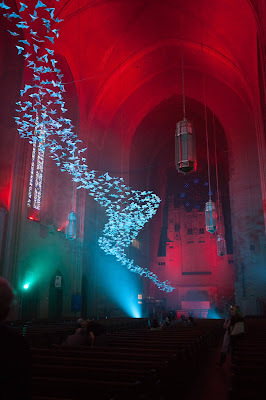 The breathtaking, meditative interactive light and sound experience transforms the flight of weightless doves soaring overhead into multi-hued, suspended gems, motionless at times, then fluttering in the most gentle of ways. 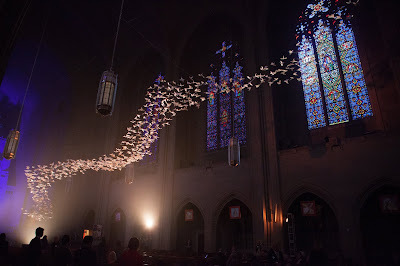 We were encouraged to walk around the Church to experience the doves' formation from multiple perspectives, each conveying a different sensation, but with the constant aspirations of connection, hope, and peace. 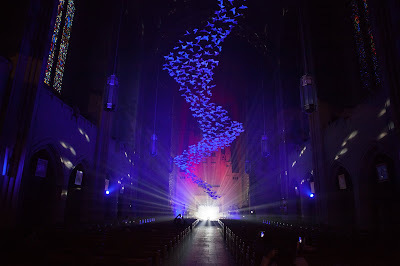 I think I can speak for everyone present that the experience was profoundly spiritual and moving. 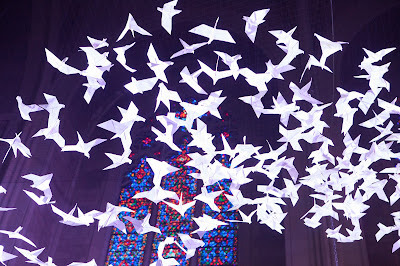 I am incredibly proud that there are doves created by Saint David's boys that will fly around the world with Michael. We can all agree that our world needs the doves' messages now more than ever. Thank you to Alumni Parents Council Chairs Winnie Feng and Annie Haddad for organizing this unforgettable event, with the church's curator Diana Smith; and to Assistant Director of Development John Dearie. The installation, free and open to the public, runs through August 18, with the sound and light show through May 19. I urge everyone to experience it. 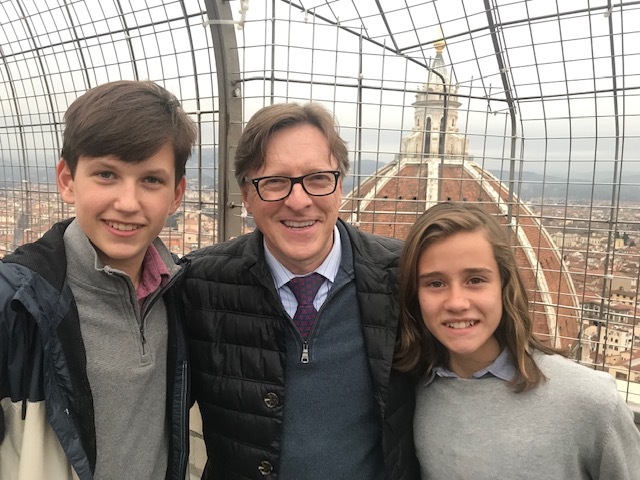 I've reported on our multi-year partnership with Dr. Derrick Gay, internationally renowned educational consultant on issues of global citizenship, diversity, and inclusion. Over these past three years, Dr. Gay has led a series of workshops with faculty and staff, parents, and students, as we continue to cultivate cultural competency and an ever stronger inclusive community. Yesterday, to further his dialogue with the boys, Dr. Gay showed a different side to his persona, providing a musical concert and a discussion about opera. A highly regarded musician, Dr. Gay has traveled the world singing opera and playing the viola. It is one of his deepest passions and informs everything in his life. The musical selections he sang ranged from Broadway classics to Mozart. He was accompanied by Music Chair Jeff Moore on the piano, with Choral Director Phyllis Clark joining him for beautifully sung duets. The boys learned how singing is a mix of the intellectual, emotional, and the athletic; and Dr. Gay shared that the collaborative nature of performing music has cultivated in him a sensibility to be sensitive to others. Our boys walked away from the session inspired and encouraged to pursue different aspects of their selves. We humans are complex, multi-faceted; it is what makes us unique. Yesterday, the boys celebrated this difference through the lens of music. 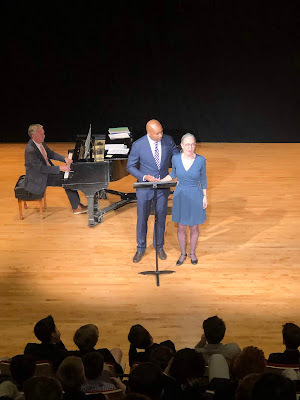 Last week, children's book author/illustrator David Ezra Stein visited Saint David's School for a special presentation in the Otto-Bernstein Performing Arts Theatre. He and his wife Miriam entertained our Pre-Primary and Grades One and Two boys with "Interrupting Chicken; the Puppet Show," based on his book Interrupting Chicken, which received a 2011 Caldecott Honor. 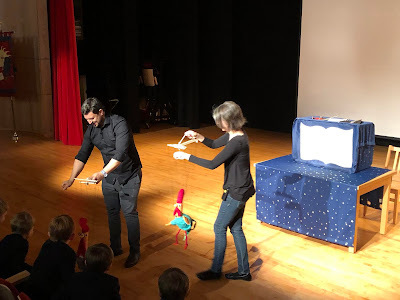 The boys were delighted by the show and fascinated as David and Miriam explained how they had created the puppets and the mechanism that controls their movements. David then read aloud his latest book: Interrupting Chicken: The Elephant of Surprise, and talked in detail about the writing/drawing process behind it. Riveted by the show and presentation, the boys eagerly asked questions about David's approach to writing, and all received signed copies of his book. By the end of this spring, all grades will experience an author visit, thanks to the vision and efforts of PA Author Series Co-Chairs Liz Carey and Ann Roberts. 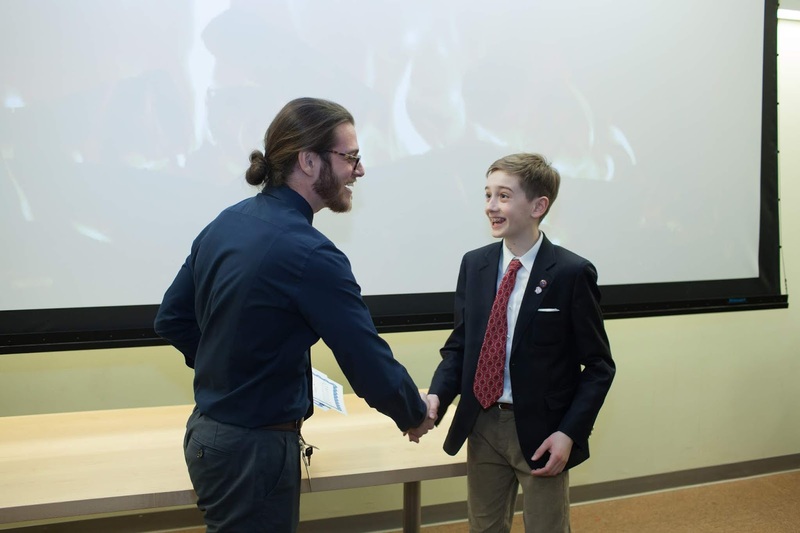 These special opportunities to interact in person with published authors inspire our boys to find their voices as authors/illustrators, and assist them in becoming confident, effective writers. I would like to share the following article about Saint David's Sophrosyne values-centered health and wellness program. Written by Dr. Evan Morse, it appears in the current issue of Saint David's Magazine. Dr. Morse and Ms. Chaiet of Prepare Inc. lead boys in role-playing strategies to combat stress. In adolescence, boys enter an exciting yet vulnerable period of rapid social and emotional development in which they begin to form an independent identity as they encounter the wider world. 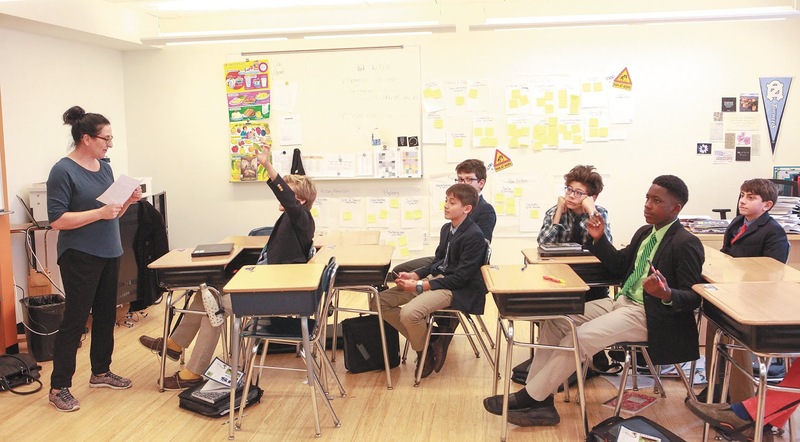 Students at Saint David’s are faced with a very large world as both digital natives and residents of a global metropolis. In recognition of these challenges, Saint David’s has continued to refine the Sophrosyne program. 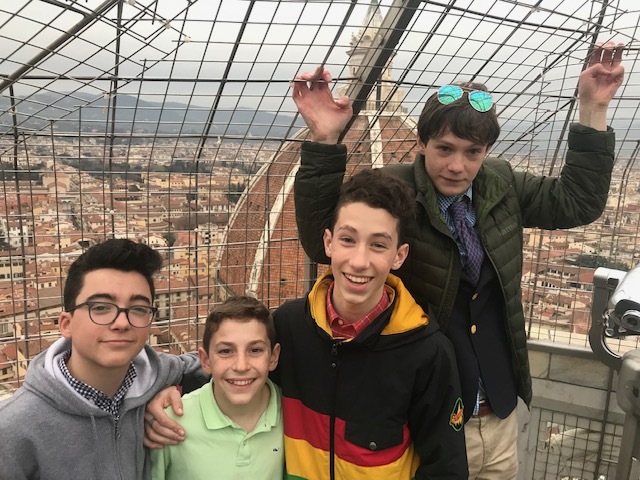 Sophrosyne is a values-centered course that helps boys navigate social, health, and wellness issues while developing a strong sense of self. 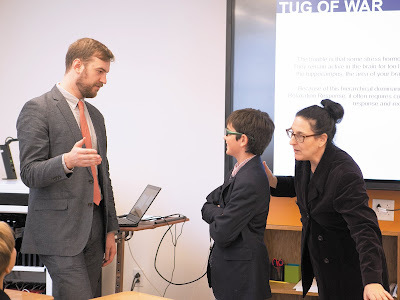 In the later years, the classes focus on particular risk factors and strategies, but the extension of the program into the Lower School reflects that the true core of the program is character education. In every grade level, Sophrosyne is an opportunity for self-reflection on virtues like empathy, respect, and friendship. 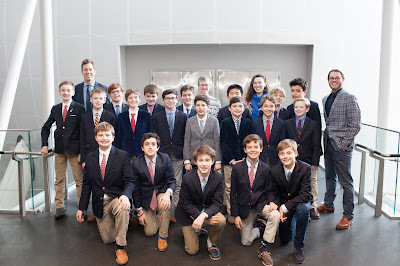 As a young program, Sophrosyne continues to expand, now spanning First through Eighth Grade. Despite its newness, the boys have begun to confidently claim the once unfamiliar term as their own. On my first day, one boy assuredly defined Sophrosyne for the class as “knowing yourself, and knowing what’s good for you.” I found this to be an excellent interpretation of a difficult-to-translate ancient Greek word that combines the concepts of good health, temperance, self-awareness, and excellence of character. “Sophrosyne” perfectly expresses the idea of a balanced program of character education. Fundamentally, this Greek moral framework conveys that right action is the result of self-knowledge. Further, since the Greek philosophical tradition does not draw a strong distinction between the body, mind, and soul, the term Sophrosyne naturally links bodily and mental health to virtue in practice. Framed in this way, the program innately situates the latest empirical research on health outcomes within a classical framework. Sophrosyne classes are grounded in the values of Saint David’s. 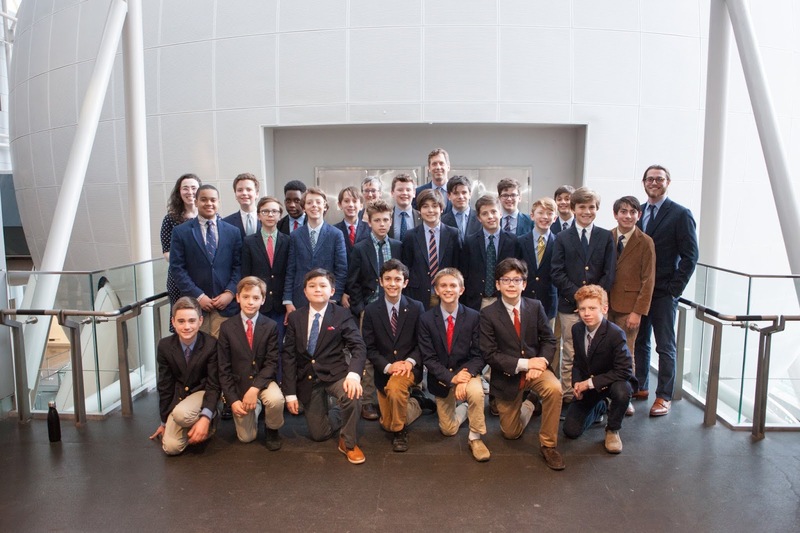 In helping boys to develop the ability to reflect on and respond to the challenges they face, Saint David’s has one particularly critical asset: a supportive community guided by an enduring mission statement. This mission-driven community underlies the development of Saint David’s reimagined health education program. 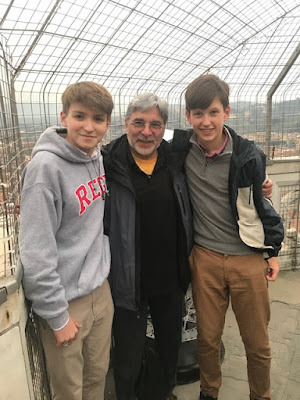 The values of Saint David’s—deliberate moral introspection, critical analysis, and a respect for religious tradition—are a beacon that guides the boys’ growth. These values bind the Saint David’s community together, allowing Sophrosyne to build connections across the school’s programs, reaching, for example, to the Religion Department for applied moral guidance, to English classes for a critical emotional vocabulary, or the advisory program for more individually guided reflection. The activities of our classes are geared toward the development of self-knowledge and its growth into self-advocacy. 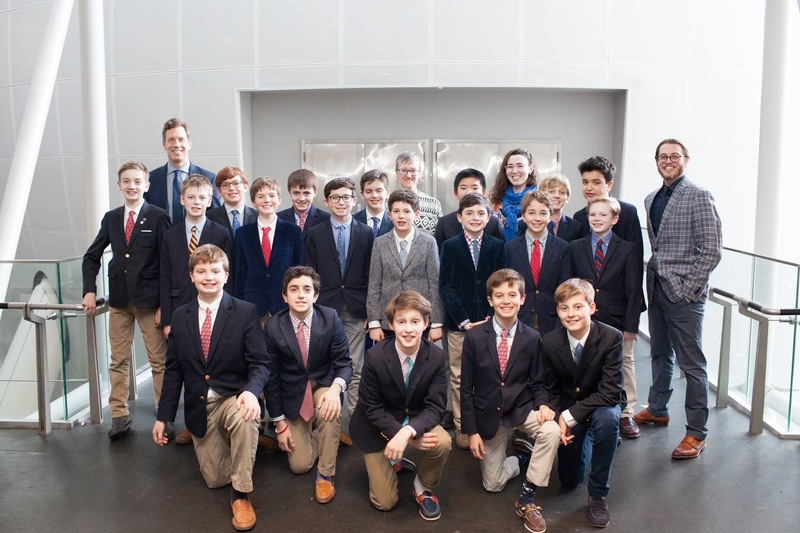 Boys are guided to consciously reflect on their own feelings, needs, and motivations and then to articulate this knowledge by appropriating the values of Saint David’s for themselves. The personal nature of Sophrosyne obliges the boys to deeply and authentically engage with these values. This discernment is the foundation of the second major emphasis of the Sophrosyne program: the forthright presentation of various perspectives on difficult topics. 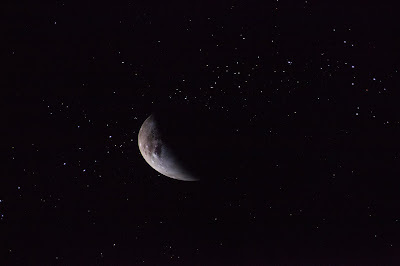 With the Hayden Planetarium shrouded in darkness, an anticipatory hush befell the crowd. Then blackness was punctuated by a pop of stars and the brilliance of planets and galaxies. The shows had begun. 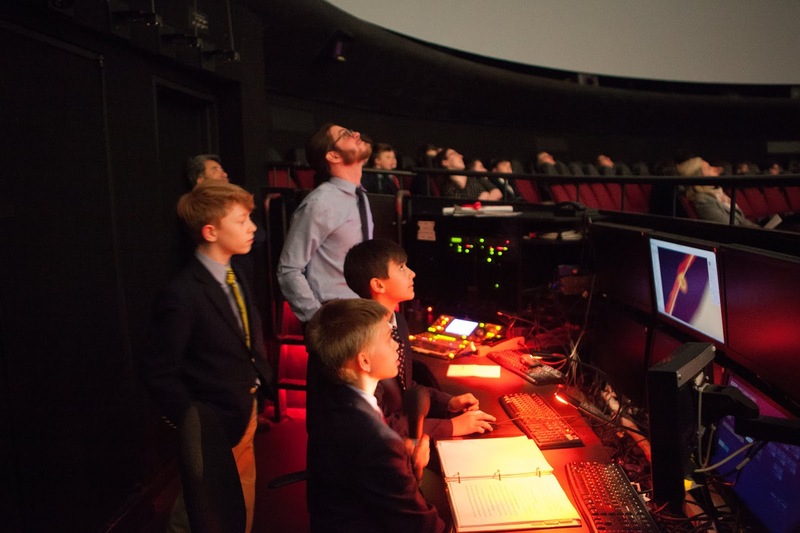 Our Sixth Grade boys were at the Planetarium's controls and narrating their original scripts, taking the audience of parents and faculty on several exhilarating space flights through the universe in their final astronomy unit research presentations. Since December, the boys had been exploring questions about the cosmos through a unique signature learning experience made possible through our partnership with the American Museum of Natural History, Hayden Planetarium: The Digital Universe Field Study. The partnership not only gave the boys access to the Planetarium's equipment and the proprietary UniView software used by astronomers and physicists, but throughout the unit they were also able to interact with and learn from the museum's educators and scientists, in addition to their Saint David's teachers. 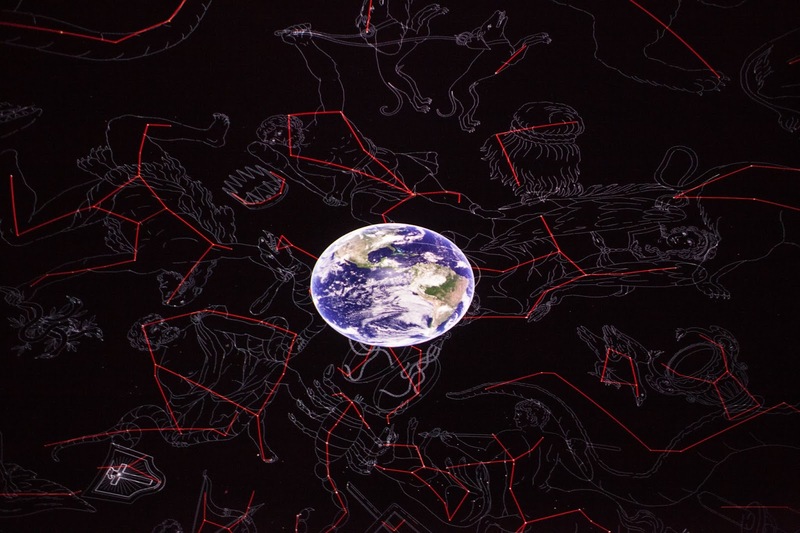 Some teams researched the stories behind well-known constellations; others, the different life cycles of a star, whether humans should move to Mars when the Sun expands, and what we can learn from the belts of our solar system. I don't know many boys who aren't thrilled by the prospect of flying through space. 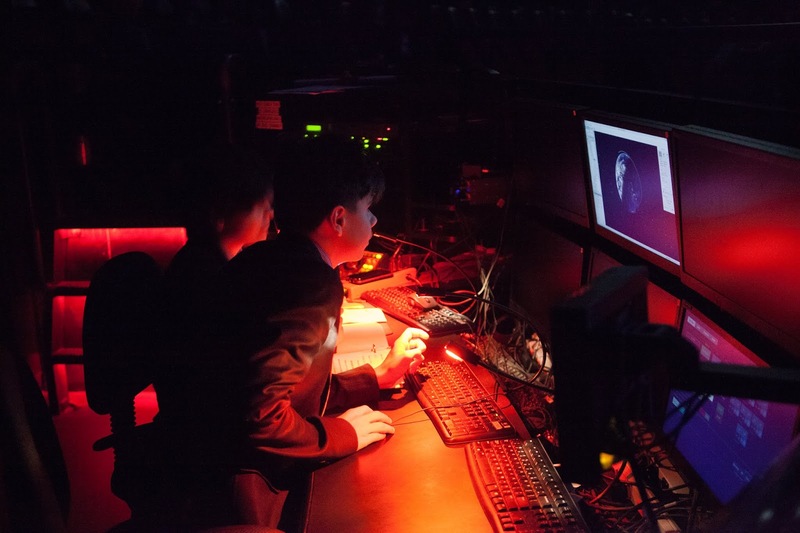 This unit allows them to do that (they even received a certificate of flight training), while conducting research on an astronomy topic of their choice, and honing writing and presentation skills along the way. In true Saint David's fashion, they also participated in a related art project inspired by their cosmic research. Congratulations to the boys and their teachers for their impressive work on a unit that explores the far reaches of space while probing the essence of humanity. The cheers shook Hyman Hall at each countdown during today's Nerdy Derby Race -- the culmination of two weeks of design, engineering and creative construction by our third graders. Working in teams, the boys had been charged with creating a mini-car that would win one of three races down a 50-foot track: Slowest, Fastest or King of the Hill (the car that stops closest to the top of the hill at mid track). 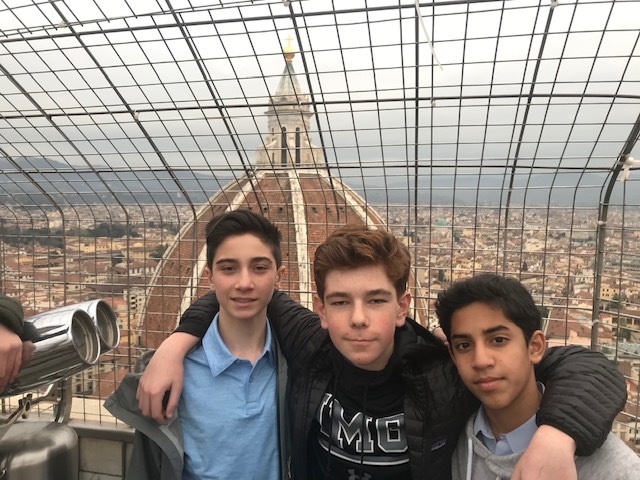 The project entailed use of the engineering design cycle and engaged the boys in educational, interactive and fun design experiences through problem solving and collaborative challenges. Congratulations to the winning teams, teachers, and to all of the boys for their effort, creativity, sportsmanship, teamwork, and enthusiasm. What a fun way to begin Spring Break! Move over, Hamilton! Saint David's second graders have a sure-fire hit with Huzzah! Huzzah!, an original play about the Second Continental Congress. Written by former faculty members, the show combines famous American tunes with a re-enactment of the deliberations of July 4, 1776. Thomas Jefferson, John Hancock, Patrick Henry were all present. 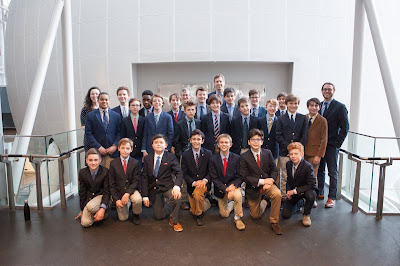 The boys were terrific; they sang with confidence and delivered their lines expertly, including an impressive recitation of The Midnight Ride of Paul Revere. What a joy for the boys to be able to perform this show for the first time in our beautiful new Otto-Bernstein Performing Arts Theatre. Congratulations to our second graders, and to producers Ms. Buhr, Ms. Falvey, Mrs. Patterson and Mr. Moore! In celebration of National Pi Day, Shailen S., Kiran K., Charlie W., and Roan S. recited as many digits as they could of the irrational number. The boys' ability to memorize so many numbers and present them in front of an audience was remarkable. 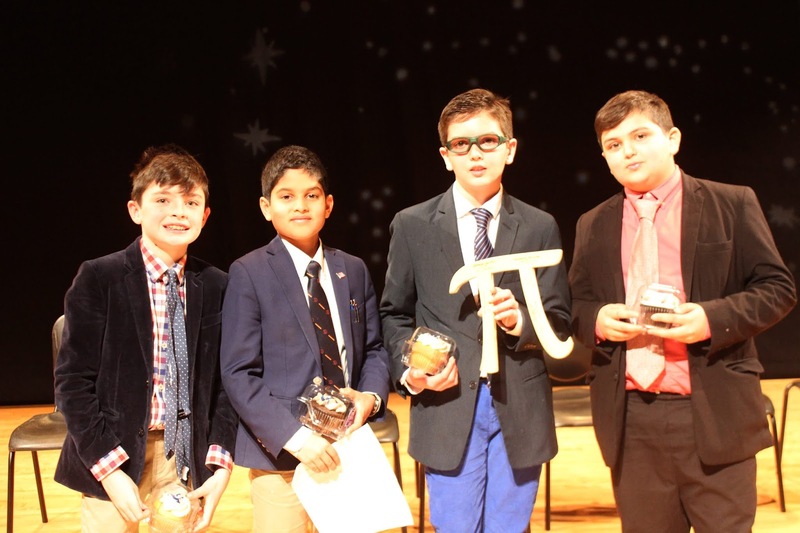 Congratulations to Roan, who recited the most--1,041 digits in a little over 8 minutes-- to an astounded audience! 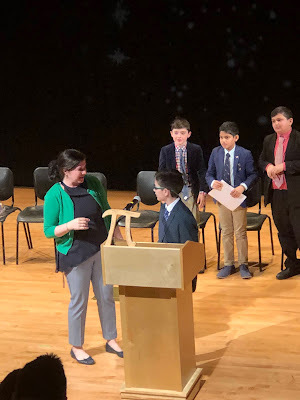 When asked by his teacher, Bridget Gallagher, how he was able to memorize so many digits, Roan replied that in addition to being able to visualize the numbers in his mind, he committed himself to lots of practice! One of the highlights of the Italian Study Tour was the steep climb up 414 steps to the Campanile atop Giotto's Tower. Before the climb, the boys engaged in a math lab, using a few instruments to determine the height of the tower. The reward for the math and the long climb was a spectacular panoramic view of Firenze. With just one day left to go, it's been a fantastic Study Tour of Rome, Assisi, and Florence. 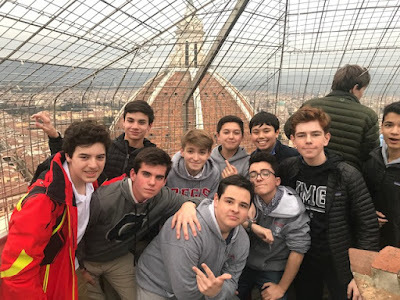 The boys have learned about, sketched and reflected upon myriad Classical and Renaissance works, drawing connections between what they've learned in class and seen in person. The presence of Fourth Headmaster Maiocco (R.I.P. ), who originated the Italian Study Tour, was most definitely close to us throughout these past few days. The trip is one of our graduating class's most memorable signature learning experiences, and we've had a great time. It is with great sadness that we announce the passing of Dr. Donald T. Maiocco, a teacher, administrator, mentor and kind friend to all at Saint David’s. His influence on the spirit and culture of this great school was profound. A man deeply committed to its mission—especially its faith tradition, the aesthetic, comportment, and the very highest of academic standards—Dr. Maiocco served the school for twelve years as its fourth headmaster. His love for the arts, respect for the classical ideals of balance and beauty and his love for the boys not only defined his tenure but also his professional life as an educator. A man of letters, Don’s intellectual passion was equaled only by his insistence on good manners and personal integrity, the dimple in the tie and the buttoned blazer. 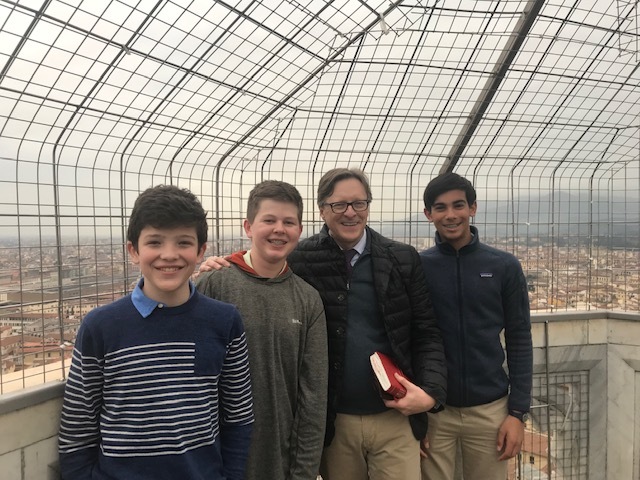 I’m convinced it was no accident that Dr. Maiocco passed while we are in Rome with the boys on their Italian Study Tour—and at the Vatican no less—touring the art and architecture of the Classical and Renaissance eras—a capstone experience introduced and treasured by Dr. Maiocco. He was a Renaissance man in deed and word. 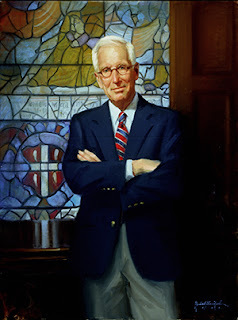 The fourth Headmaster will be deeply missed by the fifth and by a grateful community. May he rest in eternal peace.